Photo: Sprawling green grounds at Oromis. Oromis Resort, set into a lush, mountainous garden complete with a plethora of orchids, thatch bungalows and a running river alongside, is a great choice for a romantic getaway or just to enjoy a little peace and quiet on your own. 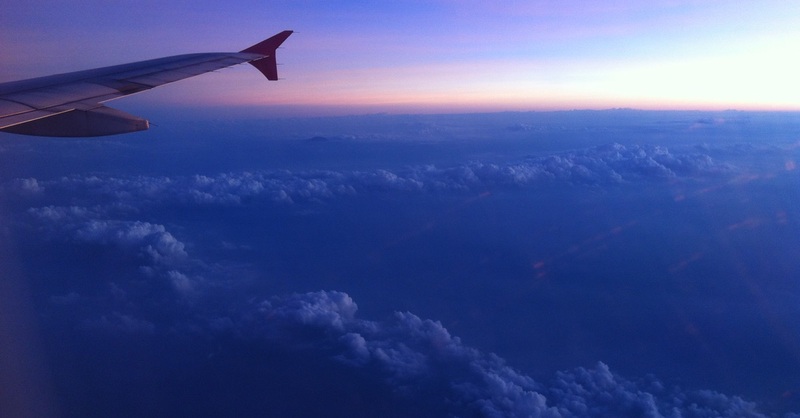 Prices start a touch above the average backpacker budget, but it’s worth every riel. As you’re heading towards the downtown area of Sen Monorom, take a right just after mile marker 118 and pull down the dirt driveway. As you enter, you’ll know you’ve made the right decision to stay. The grounds are beautifully maintained with old-style rope bridges spanning the rushing river. 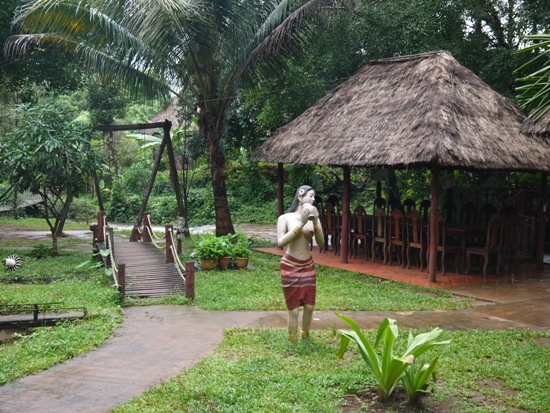 Sprinkled throughout the garden you’ll see life-size statues of traditional tribal women. Take a stroll around the beautiful gardens. Oromis has three options of room styles. 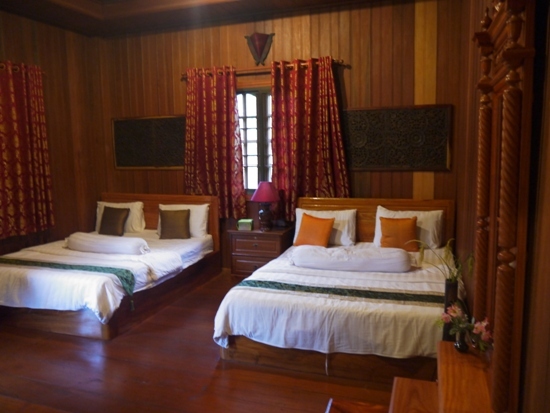 All of the rather large rooms are decorated with wooden interiors, paintings or carvings above each bed, a desk area and sturdy night stand. Dark curtains adorn the windows and, as the surrounding area is so quiet, sleeping late will not be an issue. The beds are plush with crisp, clean white linens, and brightly coloured throw pillows. Bathrooms are spotlessly clean. Immaculately clean and smartly decorated. The cheapest bungalows start at $25 a night and include two large beds, screened windows, fans and hot water. Taking a step up to the next level, for $50 you get a slightly larger bungalow, also with two beds, but including a flat screen TV, refrigerator, wardrobe and mirror. 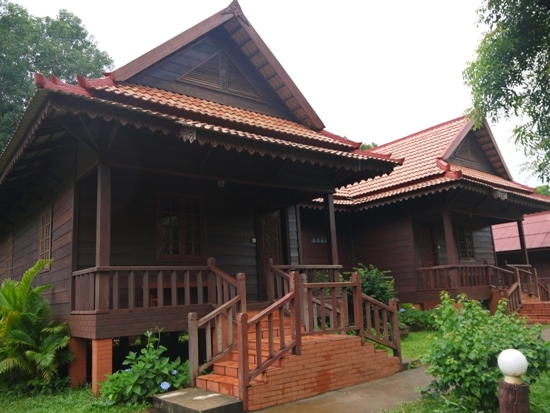 The top-tier bungalows are more suited to a family as they are quite large and include three beds, along with the previously listed amenities. None of the rooms have air-con, but due to the temperate climate and nice breeze Sen Monorom enjoys all year, you won’t have any problems keeping cool. It’s all about individual bungalows at Oromis. 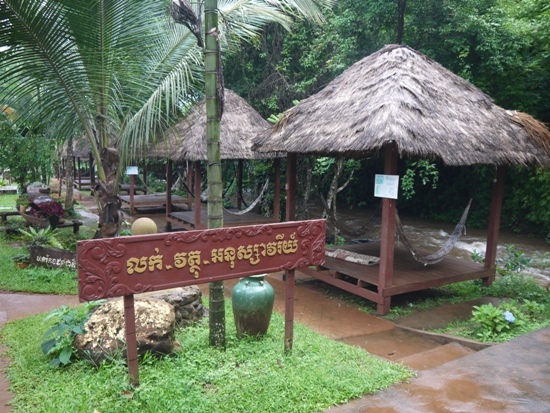 Even if you decide to opt for cheaper accommodation in town, it’s still worth stopping by Oromis to enjoy one of their delicious traditional Khmer meals or at least sit back and enjoy a cup of the famous Mondulkiri coffee while soaking up the serene atmosphere in one of their riverfront huts. Communication can be a bit of an issue as they don’t have a large number of English speaking staff — the resort is targeted more towards Khmer tourists. That’s sure to change though as more foreigners find out about this lovely tucked-away retreat. Last updated on 23rd May, 2016.